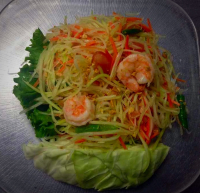 Thai famous papaya salad, a combination of green papaya, green beans, garlic, chili, tomatoes, peanuts, carrots, dried and fresh shrimp. Chef's specialty sald, shrimp, squids, scallops, mussels, mints, onions, cucumbers tossed in house chili dressing. Soft and tender beef salad with mints, onions, cucumber in lime chili dressing. Grilled beef mixed with roasted rice powder, red onions, mints leaves, fresh lime juice and chili powder. Mango, tomato, onions, cashew nuts in lime chili dressing. 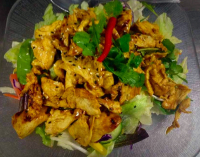 Seasoned chicken on a bed of mixed greens in lime dressing. Grilled shrimps with seasonal greens and lime dressing. 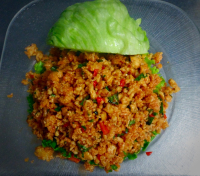 Choice of ground beef or chicken, tossed with red pepper, onions and parched rice served with lettuce. House mixed greens on crispy rice sheet, topped with dried raisin and cranberry, mango, crispy noodle with Beyond's peanuts dressing. 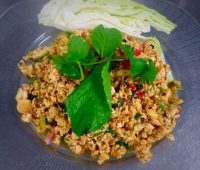 Choice of ground beef or chicken, mixed with a perfect blend of spices, onion, lemongrass, Thai chili powder and fresh lime juice.